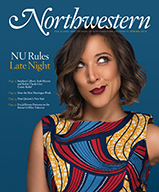 To send us a letter, click here to use our online form or e-mail us at letters@northwestern.edu. Use our online form to send us a class note. To notify us of an address change, e-mail us at address-change@northwestern.edu.